Given the Japanese penchant for the quirky and peculiar, it’s no surprise that there are some oddballs among Tokyo’s estimated 10,000 ramen shops. From “big breast ramen” to pineapple ramen to a shop where the staff all wear wrestling masks, here are ten of the strangest ramen shops we’ve encountered in a decade of regular ramen hunting across the Tokyo megalopolis. Kouno’s master takes a mild shio soup and spikes it with a full shot of high-quality tequila. He then tops it off with chili-dusted chashu, a heaping pile of cilantro and a lime wedge. And it all works marvelously. Mexican food naturally pops to mind but the bowl remains an unmistakably Japanese dish. Everything on Kouno’s menu is outstanding, so if you don’t like tequila, you have options. If you do like tequila, you can also order shots. Aroma is more of a Japanese kissaten (traditional coffee house) than a ramen shop, with a cozy vintage vibe. The shop is run by an adorable elderly Japanese couple. How exactly they came up with the house specialty — coffee ramen — is beyond us. Visually, it’s mind-blowing, with various toppings laid out to look like a face. Among those toppings: egg, banana, ham, kiwi fruit, ice cream and more. The soup contains coffee and the noodles are made by a supplier nearby — and they also have bits of coffee in them. How does it taste? Not great. But it’s a wild experience. 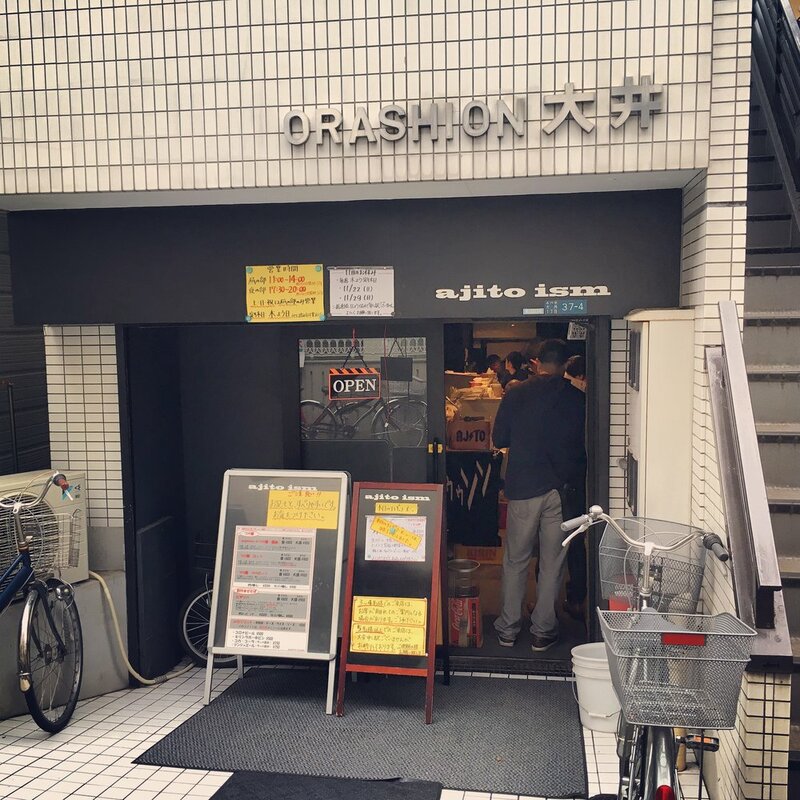 Ajito Ism in Oimachi was created by a guy who goes by the name of Mr. M. Trained as a French and Italian chef, Mr. M ran seven European restaurants in Tokyo before changing his focus to ramen. He’s brought his background in Italian cooking to bear on the bowls at Ajito Ism. M’s pizza soba is served maze style: high-quality tsukemen noodles from Kanno-Seimen are draped over a bed of tomato sauce made with blended vegetables, se abura, chicken oil and gyokai dashi. M then heaps on the pizza toppings: fresh tomatoes, onions, bell peppers, olives, anchovies and garlic. Mix everything together like you’re saucing a pasta and dig in. It’s a weird but compelling Italo-Japanese fusion. Tasty, too. Koushi in Komabatodai-mae is an unusual shop indeed. At time of writing, the shop is reservations only and limited to just eight customers per day. Furthermore, reservations can only be made via Facebook (in Japanese). The proprietor, Shibata-san is quite a character. He often wears colorful outfits, such as orange jumpsuits or yellow overalls. But don’t let the getup fool you: he’s a legit master of both ramen and Japanese sake. He offers a variety of appetizers, side dishes and ramens, but his signature dish, in our view, is the Houjun Shinasoba, a shoyu ramen made with sake kasu (the lees leftover from sake production). The alcohol content in the bowl is about 1% according to Shibata-san and it comes with a tab of butter that melts into the soup. Original. Splendid. Note: Koushi is more like an izakaya than a ramen shop. As such, you’re expected to follow the leisurely Japanese approach to wining and dining. Don’t order ramen and run. Sample a few sakes, order a few appetizers and then finish with a beautiful bowl of ramen. This is an evening out. Senrigan in Yoyogi is one of the best Tokyo shops working in the gut-buster genre of Jiro-style ramen. The shop’s gnarly Jiro bowls pull in big lines every day, but their true masterpiece is a special dish served only in summer — Hiyashi Chūka. Ramen heads come from far and wide to line up and crush this infamous bowl. Hiyashi chūka is a typical Japanese chilled noodle dish, but Senrigan does a Jiro-inspired version with all of the trimmings. A heaping pile of diced daikon, mizuna, and cherry tomatoes are served over a huge helping of choice chilled noodles, with chashu, pork back fat and a delicious sesame dressing blanketing the whole heap. There are various size options available. Order “mashi mashi” (pictured above) if you want to go balls-out; but be warned: you will be expected to finish. This bowl is essentially the world’s heartiest ramen salad. Fukumen Tomo in Jimbocho is an infamous shop known for its crazy collaborations and limited edition items that are offered once and never repeated. Regular patrons can apply for a black members-only card, which grants you the right to order special off-menu bowls and get free toppings. Strangest of all: the master and his staff are known to wear Mexican wrestling masks while they work. Note: the staff seem to be donning the masks only on special occasions lately — perhaps it gets a little hot having your head covered over a caldron of boiling soup. Kikuya is a small, family-run shop in the outskirts of Kita-Senju, a solid 15-minute walk from the nearest station. More of a shack than a shop, it's been open for over 50 years, serving ramen to neighborhood kids on their way home from school. As the master has explained in the past, one hot day some time ago a school boy requested ice cream in his ramen. After some thought, the master decided to start offering it on the menu. Soon, other kids began making more strange requests: purple ramen, red ramen, ramen with cheese slices, and more. The master was happy to oblige and the exotic menu kept expanding. Ice cream cone ramen remains the shop’s signature though — a chilled bowl of ramen with an ice cream cone split down the center and served as a topping. What a wacky, funky and simply awesome Japanese experience. Note: This shop is old, family-run and sometimes closes without notice. Prepare accordingly. Nothing appears out of the ordinary about Tsukumo in Ebisu, but they have one key claim to fame. This is the originator of cheese ramen, a bowl of thick tonkotsu piled high with a mountain of freshly grated gouda. It almost looks likes a snow-covered Mt. Fuji. As you eat, the cheese melts into your soup. Open late for those 3am cheese cravings. The pineapple theme runs deep at this shop. First, there’s the name: Pa-Pa-Pa-Pa-Pine. Then there’s the pineapple signage, pineapple color scheme, pineapple lights, pineapple chopstick holders, pineapple figurines, and on and on. Pa-Pa-Pa-Pa-Pine’s master, Hioaki Kuruta-san, is a true pineapple freak. He’s also a super nice guy. His shio and shoyu ramen both use pineapple juice in the soup and come topped with pineapple chunks. He even marinates his ajitama (soft-boiled egg topping) in pineapple juice for an extra zing. Most impressive: it all tastes pretty good. Note: This shop has announced it will be closing in April 2017. Word on the street is that the master is looking for a new location in the Machida area and plans to reopen. We’ll keep you posted. Simply put, Genki Ippai is among the very best tonkotsu ramen shops in the southern Japanese city of Fukuoka, a mecca for tonkotsu ramen. It’s also easily the city’s strangest ramen shop. For starters, the shop has no signage. Instead, the master hangs a blue bucket outside the door to indicate that the shop will be opening. If the master is unhappy with how the soup has turned out on a given day, the shop stays closed. When the blue bucket appears, ramen heads flock to line up. The master also enforces an eccentric set of rules, which are posted in the shop. 1. No cell phone use inside (including texting, web browsing or anything else). 3. Upon receiving your bowl, you must drink some of the soup before eating any of the noodles. 4. Adding the usual spicy pickled takana (mustard greens) is forbidden until after you've eaten some of your bowl. 5. Do not ask the master questions about the ramen. 6. Talking about ramen in general or speculating aloud about the ingredients is forbidden within the shop. If you break any of these rules, you will be asked to leave (we know people who have been thrown out for surreptitiously snapping a photo — don’t even try it). 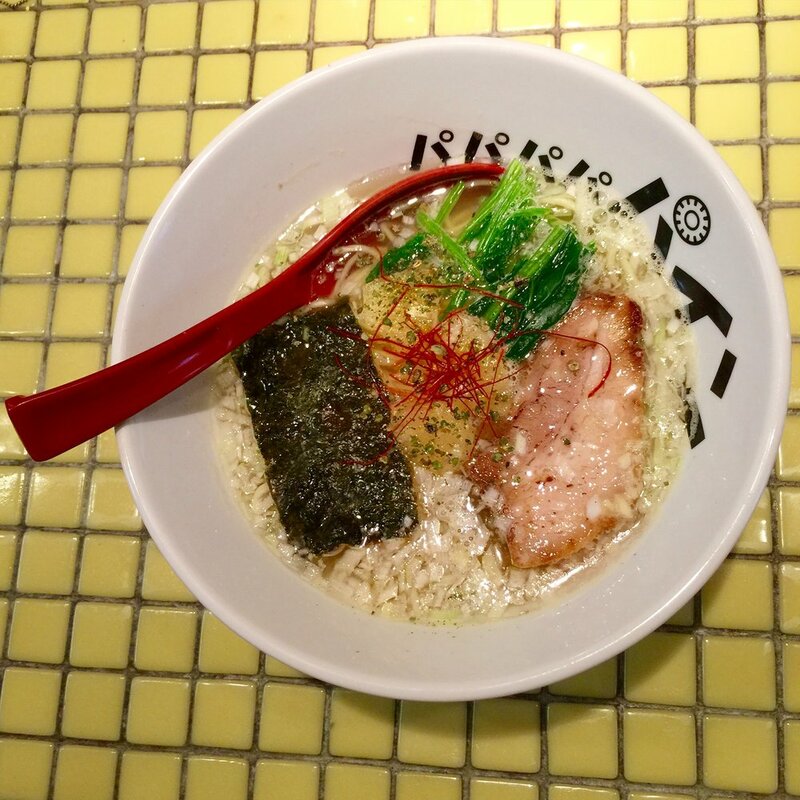 Despite the soup nazi code of conduct, this is a must-eat bowl for any ramen serious ramen fan — some of the richest, heaviest Hakata-style pork soup you will find anywhere.